This should be easy, despite our problems (see under comments). 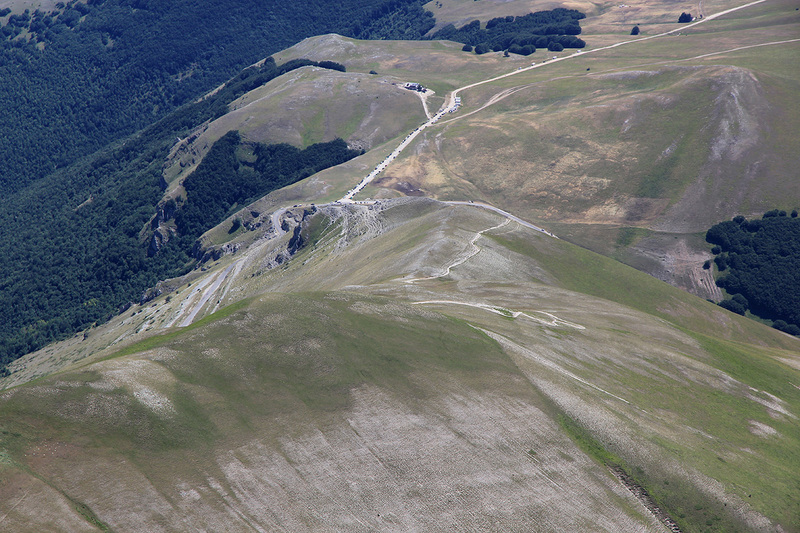 Monte Vettore is located in Parco Nazionale dei Monti Siblini. 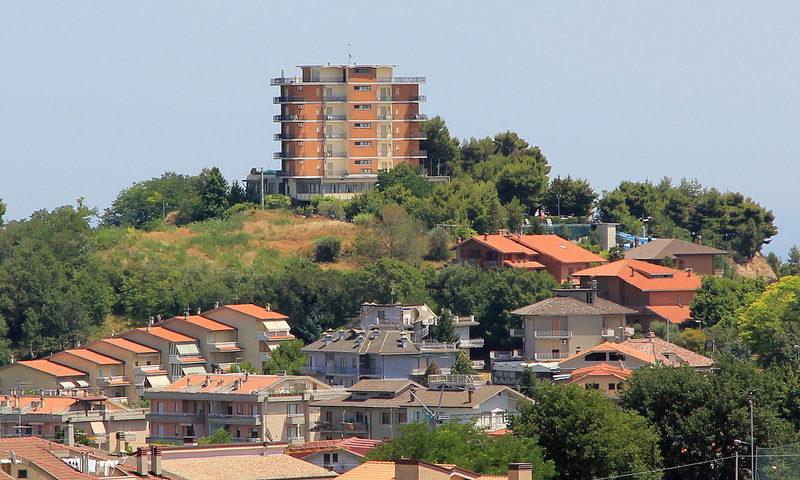 This park is north of L'Aquila and west of Ascoli Piceno. Locate Hwy. SS4, the best acess is.. The route starts from the col (highest point) on the road, a pretty broad gravel trail. Follow this trail uphill, first fairly steep, then more level. 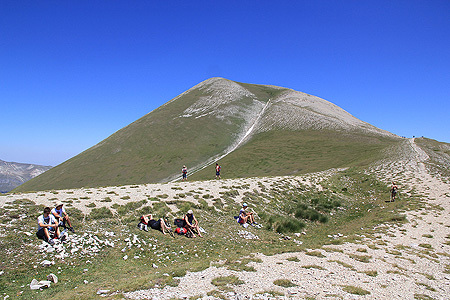 The trail makes its way uphill and eventually turns slightly steeper just before reaching the key col between Monte Vettore and the west peak called Cima del Redentore. This location is at N42:49.064, E013:16.121, elevation close to 2250 meter, that is a gain of 700 vertical meter from the trailhead. A small hut is also located here. it was not open when I visited. The wide trail continues up (turning right at the saddle!) easy slopes to the summit of Vettore. The day started (and ended) with a strong reminder of how modern technology may get you into deeper trouble than what used to be the case in earlier times. We slept near L'Aquila. 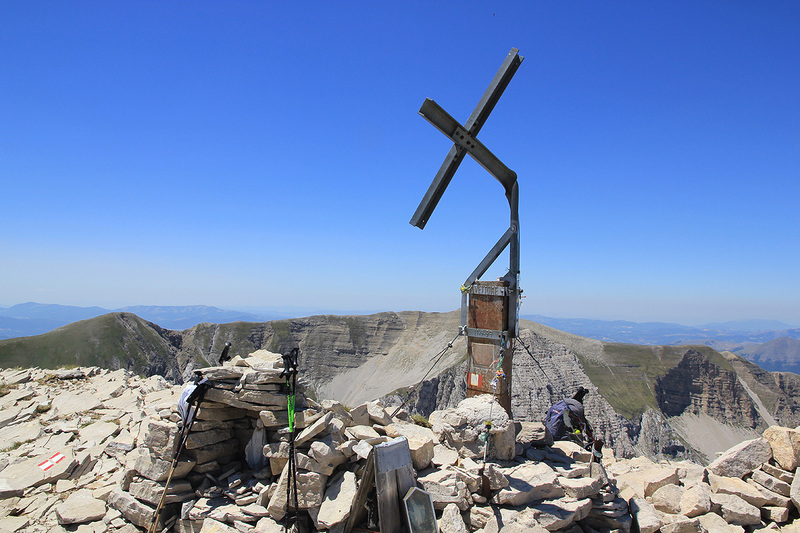 I checked a trip report on Monte Vettore. 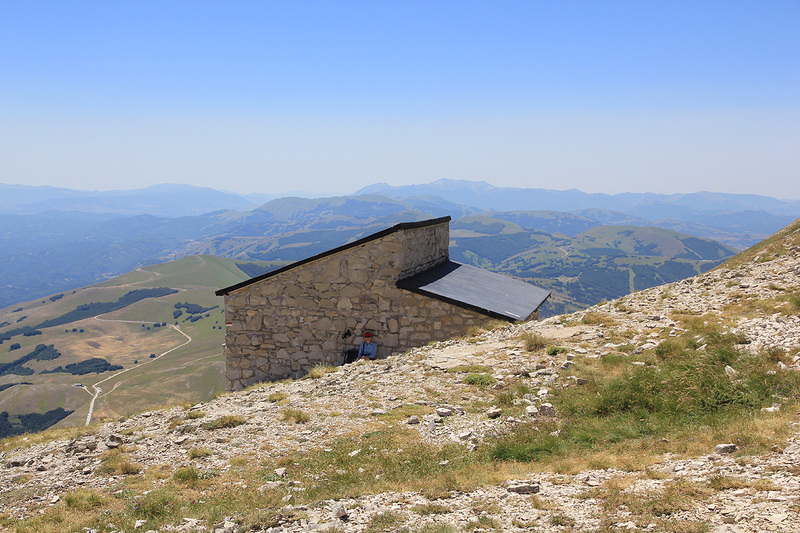 It simply said: "Drive from Ascoli Piceno up to the col Forca di Presta." My mind thought about a small village and a simple sign pointing to a nearby mountain pass. 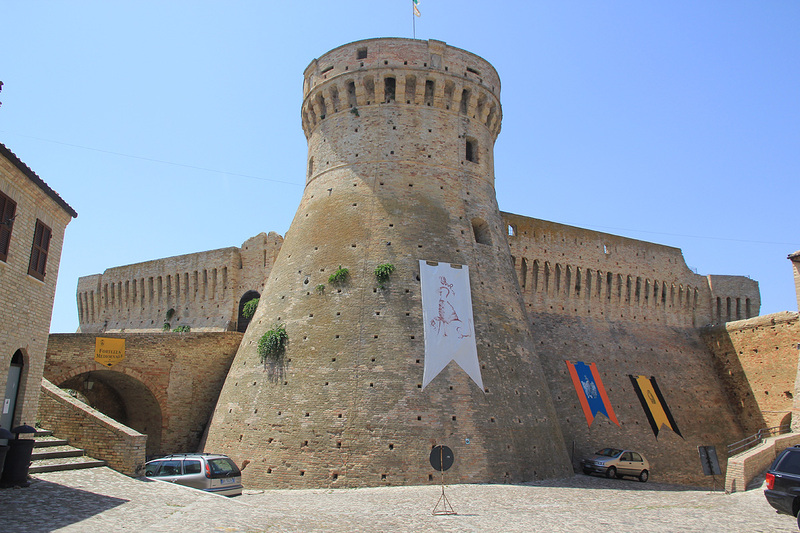 Thus, we entered Ascoli Piceno into our car navigation system and set off. The navigational system decided to route us via many local villages and generally tiny roads (Google maps picked a slightly longer, but mainly autostrada route.) Finally in Ascoli Piceno, we discovered a large, industrial city. Consulting our map (first time!) 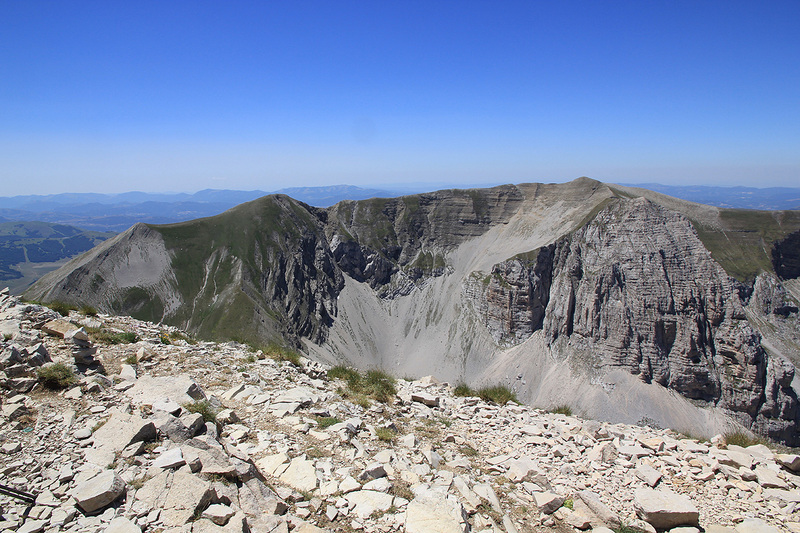 we realized that Ascoli Piceno was a mistake altogether, we should have driven to Monte Vettore directly from L'Aquila. On our return drive to the coast, we started out with a distance of 48 km. After driving about 10 km, the system wanted us to turn right on a very narrow and horribly looking dirt road. When I refused this option our remaining distance was suddenly 63 km!! What option can make my navigational system stay clear of dirt roads? I started out at 1150. The entire area near the col was a big chaos as a bike race crossed the col at the same time as my arrival. I arrived at the main col at 1300 and took 5 minute break in the grass while finishing off my first bottle of water. The remaining ascent was easy and I arrived at the summit by 1325. 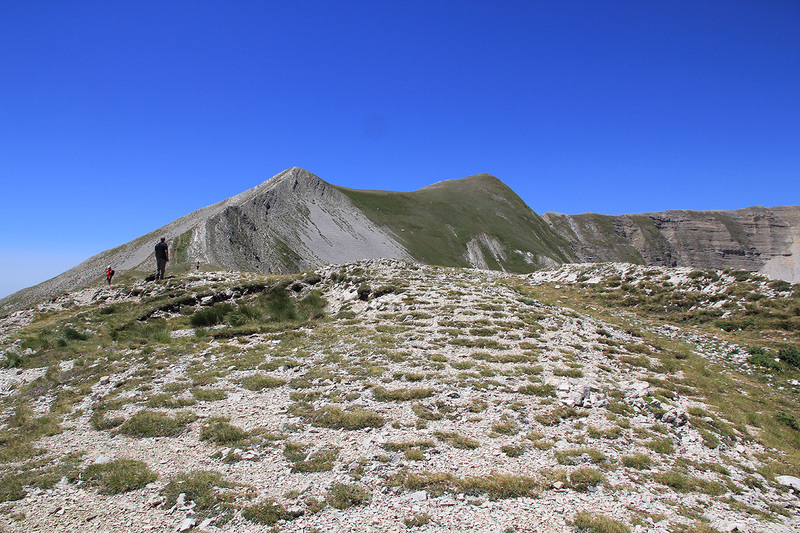 Leaving at 1330, I had looked at the very interesting ridge route to Cime del Redentore. In fact, since I had plenty of time, I decided to give it a try. 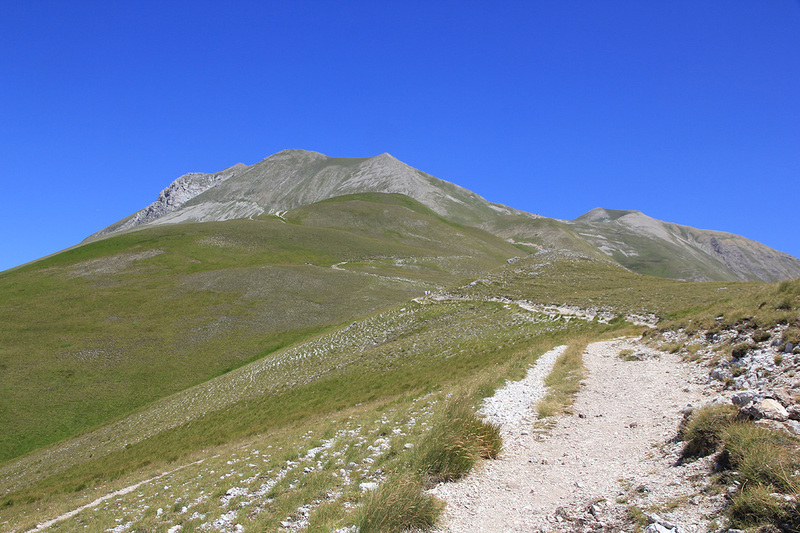 The route was just as fun as it looked and I stood on Redentore 50 minutes after leaving Vettore. I felt better as the day progressed and finished my trip by jogging down from the main col to the trailhead with an average rate of descent at 100 vertical meter every 5 minutes. I was back down at the col at 1525 meeting Heidi. 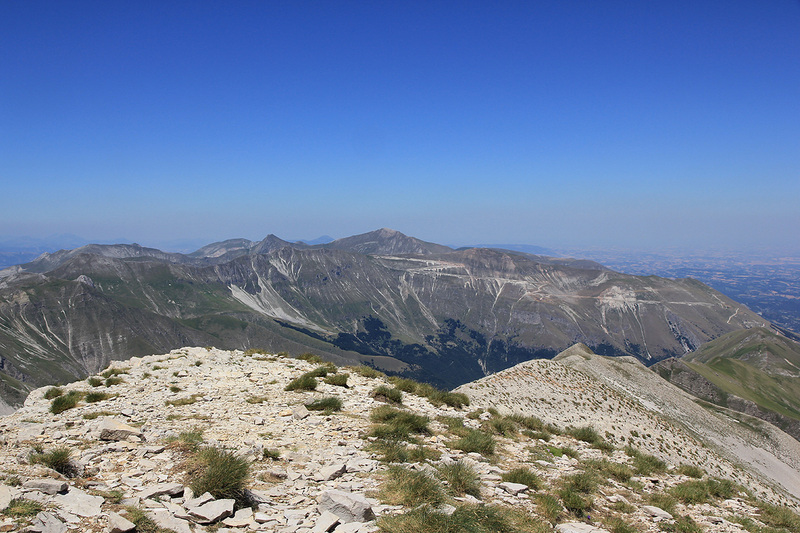 She had enjoyed a nice hike from the Rifugio to a viewpoint sort of in the opposite direction. I had already reserved a nice room at the Abbadetta Hotel for two nights. 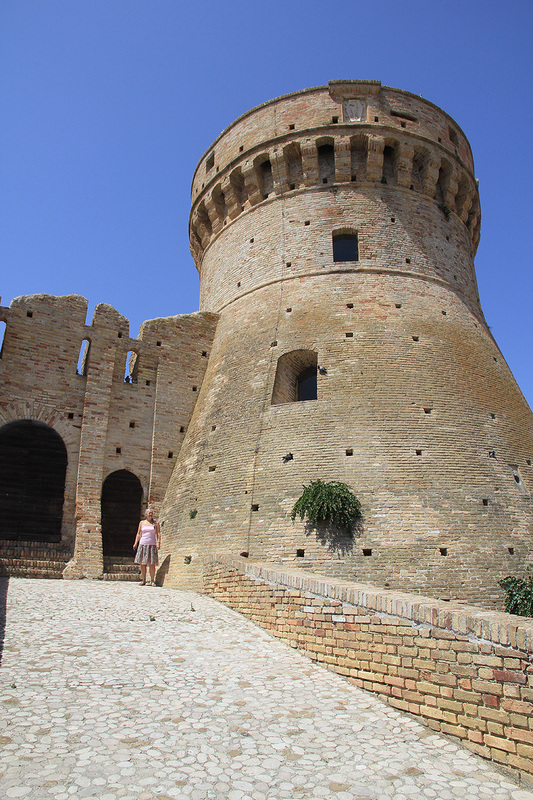 We spent the next day relaxing by the pool and exploring the nearby medival village with an old castle with impressive towers protecting the local fields. 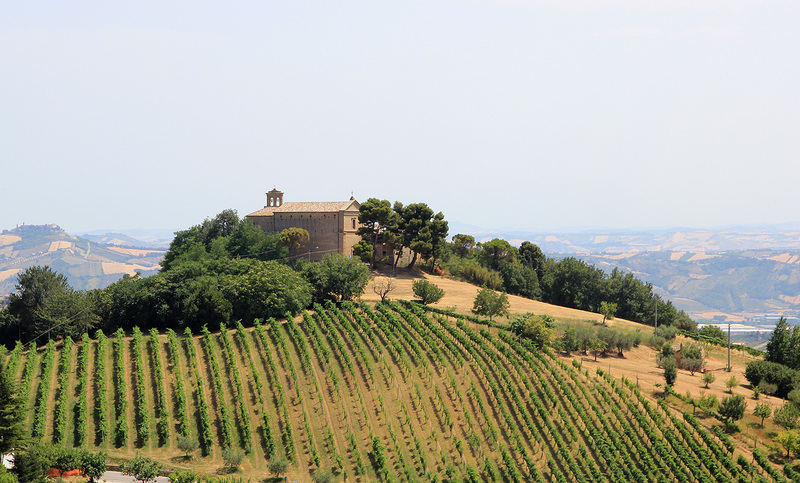 This concluded our sweep of middle Italy, after a well deserved rest we would head north east to the Dolomites. 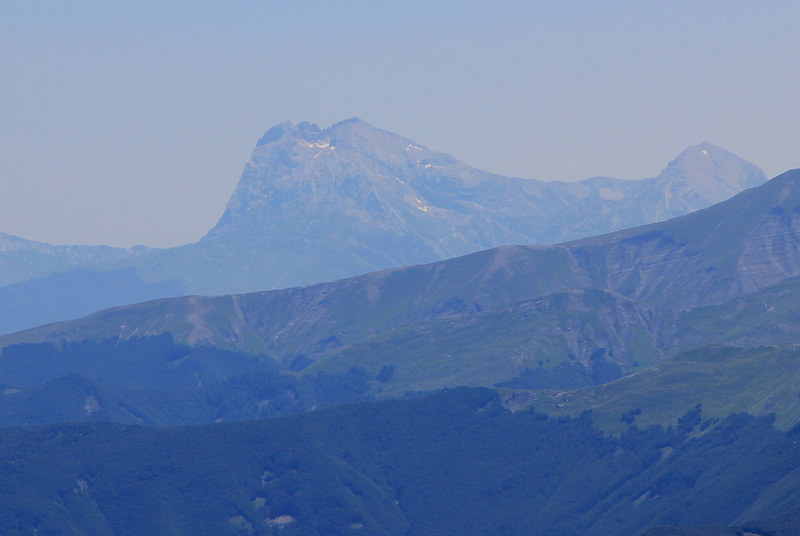 Corno Grande, as seen from Monte Vettore.